Franconian Velvetshield – also known by the names: Bouclier de Velours de Franconie, Fränkisches Samtschild, Scudo Vellutato in Franconia, Франконский вельветовый щитковый – is a variety derived from Franconia (Germany), which began to be developed since 1840. 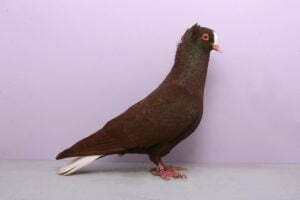 Varieties are categorized Colour pigeons type is a good aviator, but its development is now directed as a display pigeon. Now, this variety has been raised in various countries in Europe and America.